The Epipaleolithic began after the end of the last Ice Age in much of the world or the Mesolithic in Europe. It was a time of great transition . Starting around 12,000 years ago temperatures rose rapidly and got to pre-industrial levels by 9,000 years ago . For several thousand years after this warming occurred, humans maintained a hunter-gatherer way of life. While people in the rest of the world maintained a mobile hunter-gatherer way of life even after the ice sheets had retreated, in the Eastern Mediterranean something more revolutionary began to occur. Before 14,000 years ago during a period known as the Kebaran, Levantine people generally lived in caves or in the open air [3-4]. These were small, seasonal camps, which were not occupied long-term [5-6]. Between around 14,000 and 12,000 years ago there is evidence that habitation sites began to be regularly occupied . By around 12,000 years ago, it is thought that these people were living in mostly settled communities . This occurred some 3,000 years before the introduction of agriculture, when people still relied on hunting and gathering to survive. These new settled people are known to archaeologists as the Natufians. The Eastern Mediterranean had not only become warmer, but also wetter during this period and it is thought that this may have led to enough food being available that people stayed in one place . This was revolutionary because it meant that the Natufians were able to get all of their resources without constantly moving. Settled communities were a first step towards developing agriculture, because it meant people were more attached to the land around them. 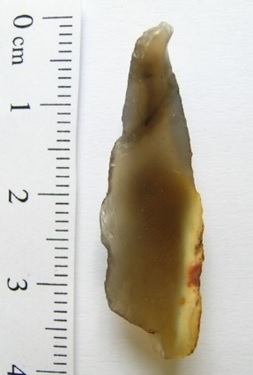 The Epipaleolithic era is characterised by tools known as microliths – tiny flint blades, no more than a few centimetres long, which were attached to wooden handles [3,9-10]. They also used pestles and mortars [11-12], which were used to grind cereals, bones, and ochre for decoration. Unlike earlier cultures, the Natufian people were among the first to construct buildings out of stone, with brushwood rooves and central fireplaces . The Natufian diet consisted of wild cereals, pulses, nuts, and fruit, along with fish, gazelle, deer and cattle . They were the first people to purposefully cultivate rye, possibly due to a decline in wild plants, caused by brief cold climatic periods . Unlike their predecessors, the Natufian people used cemeteries intensively, and over 450 graves have been found so far in places such as Raqefet Cave [4,16]. Many graves appear to have been dug outside homes or in deserted buildings, and occasionally marked with limestone slabs. Group burials were common in early Natufian culture, and in later years, there is some evidence of skull removal . In a couple of sites, humans were even buried alongside dogs [18-19]. It was common for the Natufians to bury their dead with personal belongings, typically jewellery, headdresses and belts made from shells, bone, teeth and beads . More exciting grave goods include a stash of 50 complete tortoise shells, the remains of a leopard, and a limestone model of a human head [20-21]. Ancient DNA evidence has shed light on the origins of the Natufians. 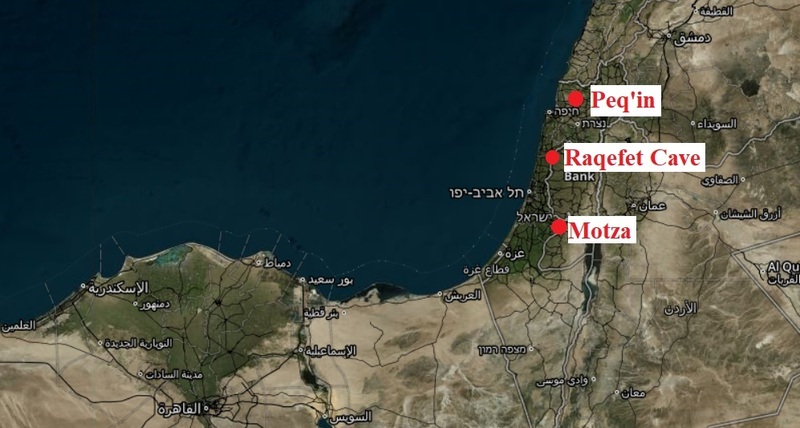 In 2016, the DNA of five males and one female from Raqefet Cave was sequenced . All six individuals had been found in single or double burials, either on their back or side in a flexed position. Like all Natufians, the inhabitants of Raqefet derived half of their ancestry from ‘Basal Eurasians’. The Basal Eurasians are a lineage thought to have split off prior to the differentiation of all other European lineages, and prior to the interbreeding between Neanderthals and modern humans that occurred around 50,000 – 65,000 years ago . The Western Mediterranean holds a special place in the story of early farming being first place in the world where this technology occurred. Beginning in an area known as the fertile crescent, which stretches across the present-day countries Syria, Jordan, Israel and Iran, farming began to appear between 10,200 – 6,900 years ago . The beginning of this period coincided with the end of the last ice age, around 11,700 years ago, when the climate of West Asia was warmer and wetter than today . Neolithic farmers were descended from the Natufian hunter-gatherers of the preceding Epipaleolithic period, who began cultivating cereals as early as 15,000 years ago [15,22]. Agriculture also did not emerge in one single place in West Asia; instead, the domestication of different species occurred independently in various regions over hundreds of years . For instance, barley was domesticated at sites as widespread as Abu Hureyra, Syria; Jericho, Palestine; and Ali Kosh, Iran . Similarly, goats were domesticated independently in central Iran and eastern Turkey as early as 10,000 years ago . By the end of the Neolithic, the people of West Asia were farming wheat, millet and spelt, and breeding dogs, sheep, pigs and cattle. The Neolithic in the levant saw the emergence of rectangular or round mud-brick buildings, that often had two stories . Occasionally, walls and floors were decorated with white or red plaster [30-31]. 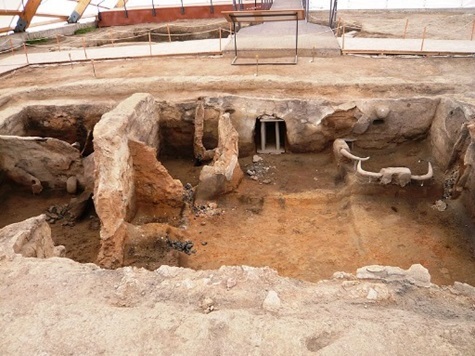 Some of these settlements were large - Çatalhöyük was inhabited by 8,000 people, and Jericho had an area of six acres, surrounded by a huge stone wall and round watchtower . At Hallan Çemi, an early Neolithic site in Turkey, two circular structures at least five times larger than any other building have been found. Both show little evidence of everyday life; instead, exotic materials such as copper ore and obsidian were found there [33-34]. 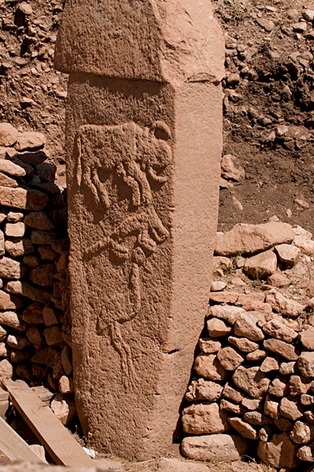 Similar symbolic structures, some featuring huge limestone pillars, carved reliefs of animals or collections of human skulls, have been found at Çayônu, Nevah Çori, and Gôbekli Tepe . It was common for the Neolithic people to bury their dead under the floors of their houses . In some cases, skulls were removed after death and decorated with paint, clay and shells, before being reburied elsewhere . The first pottery appeared in the area around 7,500 years ago [25,32]. The microliths that characterised the previous Epipaleolithic period were no longer made in the Neolithic. Instead, stone arrowheads and mace heads were produced. These were not only used on animals, but possibly also on other humans . Trade networks expanded significantly during the Neolithic, and materials like obsidian and seashells were traded over long distances. Obsidian tools sourced in Turkey have been found in present-day Jordan and Iran, and the obsidian used at Çatalhöyük was obtained from a site 125 kilometres (78 miles) away . In 2016, ancient DNA from a male from the Motza Tachtit site was analysed . Genetic analysis suggests that Neolithic farmers from the Levant (modern-day Israel, Jordan and Syria), such as this man, had very similar DNA to the Natufian hunter-gatherers of the preceding Epipaleolithic period. It seems these Levantine farmers were direct descendants of the Natufians, and can trace approximately two-thirds of their ancestry to them. While the appearance of agriculture had transformed human societies and the landscapes, Neolithic peoples had still been using technology largely based on stone tools. The appearance of metal working dramatically changes the course of history and coincided with an increase in the complexity of farming societies. Once surpluses of food could be made and dairying started to appear, more people could focus on specific crafts. This led to a revolution in social complexity, and the appearance of social stratification . Copper is a metal that naturally occurs in clumps and small pieces that are relatively pure . Many prehistoric societies found this material and made it into various art objects, but it was not until the Late Neolithic that people began mining copper ore in an organized manner . 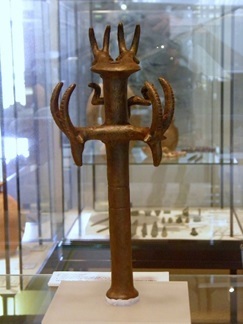 The Copper Age, which is also referred to as the Chalcolithic, lasted from roughly 7,000 to 4,000 years ago . It is thought that the technology spread quickly between regions, but likely had a single origin somewhere in West Asia . In the late Neolithic, Levantine villages became larger and more clustered, possibly for protection from attack [41-42] and found in more arid areas where Neolithic people had not lived previously . 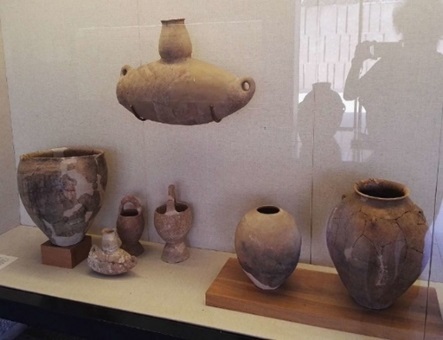 Artifacts found in village sites dramatically change over a short period of time from the Neolithic to the Copper Age, with new pottery styles appearing without any precursors . Burial practices shifted from simple burial plots within each settlement, to elaborate placement in caves with artifacts such as chalices and bowls . Metal artifact hoards have also been discovered . The scale of change has led some researches to suggest that there was a wave of immigration coming from another neighboring region, possible with metalworking cultures . This new Copper age society is known as the Ghassulian Culture in the Levant. There is evidence of mining at the site of Tell Abu Matar , and there were also new technologies for farming and dairy production. Many ceramics have been thought to be milk vessels and there may have been an increase in the use of dairy products . While olives had been collected from wild trees for thousands of years prior to the Copper Age, the first domestication of the olive tree occurred during this period in the Levantine region . Genetic analysis from individuals at the Peq’in Cave site dating to this period show that these individuals were most closely-related to earlier Levantine populations that have lived in the area since the Neolithic, but around 35% of their DNA also came from Chalcolithic Iranians, and Anatolian farmers from the north . This suggests that the theory that there might have been migration into the area from surrounding regions may be true to an extent, although the local population that existed before the Copper Ages appears to have largely remained in place despite newcomers. Greenfield H. 2006. The spatial organization of Early Neolithic settlements in temperate southeastern Europe: a view from Blagotin, Serbia. In: Robertson JDS Elizabeth C, Fernandez Deepika C, Zender Marc U, editors. In Space and Spatial Analysis in Archaeology. Calgary: University of Calgary Press. pp. 69–79. Maher, L. A., Richter, T. and Stock, J.T. 2012. The Pre-Natufian Epipaleolithic: Long-Term Behavioral Trends in the Levant. 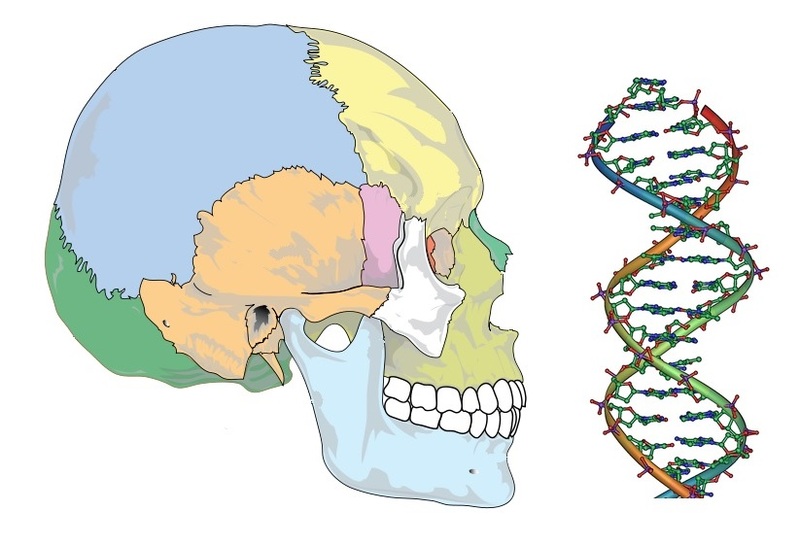 Evolutionary Anthropology 21: 69–81. Belfer-Cohen A (1991) The Natufian in the Levant. Annual Review of Anthropology 20: 167–86. Nadel, D. and Werker, E. 1999. The oldest ever brush hut plant remains from Ohalo II, Jordan Valley, Israel (19,000 BP). Antiquity 73: 755–764. Boyd, B. 2006. On 'sedentism' in the later Epipalaeolithic (Natufian) Levant. World Archaeology 38: 164-178. Willcox G, Buxó R, Herveux L. 2009. Late Pleistocene and Early Holocene climate and the beginnings of cultivation in northern Syria. Holocene 19(1):151–158. Nadel, D. 2002. Indoor/outdoor flint knapping and minute debitage remains: the evidence from the Ohalo II Submerged Camp (19.5 KY, Jordan Valley). Lithic Technology 26: 118–137. Belfer-Cohen, A. and Goring-Morris, N. 2002. Why microliths? Microlithization in the Levant. In: Elston, R.G. and Kuhn, S.L. (eds). Thinking small: global perspectives on microlithic technologies. Arlington: American Anthropological Association, 57–68. Yaroshevich, A., Kaufman, D., Nuzhnyy, D. et al. 2010. Design and performance of microlith implemented projectiles during the Middle and the Late Epipaleolithic of the Levant: experimental and archaeological evidence. Journal of Archaeological Science 37: 368–388. Nadel, D., Danin, A, Werker, E. et al. 1994. 19,000-year-old twisted fibers from Ohalo II. Current Anthropology 35: 451–458. Stock, J.T., Pfeiffer, S.K., Chazan, M. et al. 2005. F-81 skeleton from Wadi Mataha, Jordan, and its bearing on human variability in the Epipalaeolithic of the Levant. American Journal of Physical Anthropology 126: 453–465. Munro, N.D. 2004. Zooarchaeological measures of hunting pressure and occupation intensity in the Natufian. Current Anthropology 45: S5–34. Davis, S.J.M. and Valla, F.R. 1978. Evidences for the domestication of the dog in the Natufian of Israel 12,000 years ago. Nature 276: 608–610. Tchernov, E. and Valla, F.R. 1997. Two new dogs, and other Natufian dogs, from the Southern Levant. Journal of Archaeological Science 24: 65–95. Belfer-Cohen, A. and Hovers, E. 1992. In the Eye of the Beholder: Mousterian and Natufian Burials in the Levant. Current Anthropology 33:4, 463-471. Grosman, L., Munro, N.D. and Belfer-Cohen, A. 2008. 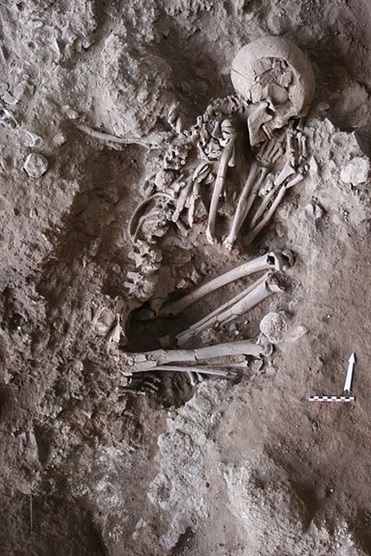 A 12,000-year-old shaman burial from the southern Levant (Israel). Proceedings of the National Academy of Sciences 105(46): 17665-17669. Kuijt, I. 2008. The regeneration of life: Neolithic structures of symbolic remembering and forgetting. Current Anthropology 49(2): 171–97. Stein G. 2012. The development of indigenous social complexity in Late Chalcolithic Upper Mesopotamia In the fifth–fourth millennia BC: An initial assessment. Origini, 34: 125–151. Rowan YM, Golden J. 2009. The Chalcolithic period of the southern Levant: A synthetic review. Journal of World Prehistory, 22: 1–92. Roberts BW, Thornton CP, Piggott VC. 2009. Development of metallurgy in Eurasia. Antiquity 83: 1012–1022. Gal Z, Smithline H, Shalem D. 1996. A Chalcolithic burial cave in Peqi’in. Qadmoniot, 111: 19–24. Gal Z, Smithline H, Shalem D. 1997. A Chalcolithic burial cave in Peqi’in, Upper Galilee. Israel Exploration Journal, 47: 145–154. Levy TE, et al. 1994. Protohistoric investigations at the Shiqmim Chalcolithic village and cemetery: Interim report on the 1988 season. Annual of the American Schools of Oriental Research, 51: 87–106. Elliott C. 1978. The Ghassulian Culture in Palestine: Origins, Influences, and Abandonment, Levant, 10:1, 37-54. Rowan YM, Golden J. 2009. The Chalcolithic period of the southern Levant: A synthetic review. Journal of World Prehistory 22: 1–92. Ussishkin D. 1971. The ‘Ghaussulian’ temple in Ein Gedi and the origin of the hoard from Nahal Mishmar. Biblical Archaeologist 34: 23–29. Harney E. 2018. Ancient DNA from Chalcolithic Israel reveals the role of population mixture in cultural transformation. Nature Communications 9:3336. Gilead I, Rosen S, Fabian P. 1991. "Excavations at Tell Abu Matar (the Hatzerim Neighbourhood), Beersheva". Mitekufat Haeven-Journal of The Israel Prehistoric Society, 24: 173-179. Galili E, Stanley DJ, Sharvit J, Weinstein-Evron M. 1997. Evidence for earliest olive-oil production in submerged settlements off the Carmel Coast, Israel. Journal of Archaeological Science, 24: 1141–1150.